The author of the book Smart Change discusses the brain science behind the 3 p.m. slump, focusing on what he refers to as your “Go System” and “Stop System” – both of which function less well as your workday goes on. This results in the scenario where your Go System is fading after hours of sustained attention and hard work, and the Stop System — which also requires effort to engage — is less able to stop behaviors as well, explaining: “If you are tempted to do something that is not central to the tasks that need to be accomplished, you’ll be better at pushing that temptation aside early in the day than late.” So what can you do? He suggests structuring your day so that the tasks requiring more internal motivation (like working on a report) are accomplished early in the day, while those that engage you from the outside, such as touring a new work facility, are reserved for later. Finding a mentor is challenging, especially finding one who’s a “right fit for your needs, strengths, and shortcomings.” In this article, ten of the world’s most sought-after mentors offer their tips on how to find the right mentor and prove yourself the “exceptional mentee,” ranging from finding someone who is living your dream to being open to tough love. If you consider yourself a serial entrepreneur, then this post is for you. The author discusses five tips from the (“classic”) book, Serial Winner: 5 Actions to Create Your Cycle of Success: make a decision, any decision, and move on; don’t just build a business, change the world; be prepared for many pivots, but never quit; trying is not enough, you have to deliver; and lastly, each success incents a dozen greater ideas. He then offers his own considerable insights, as well as advice for entrepreneurs. Automating business operations and processes is no longer just for large companies. Small businesses are leveraging smart tools to reduce costs and improve efficiencies as they remove redundancies from their process and boost their bottom line. Here, the author discusses six notable benefits of small business automation, from scalability as your business grows to freeing up your time, and suggests specific resources. While startups struggle with volatility, scaling companies struggle with the added dimension of complexity. Citing the chief product officer at Adobe and his new book, The Messy Middle: Finding Your Way Through the Hardest and Most Crucial Part of Any Bold Venture, she details three of his tips for “founders and others in the middle of both ambitious undertakings and their own leadership journeys”: take a light touch to process; market internally; and help your hires. 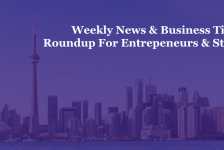 September proved to be a boon for Toronto’s tech ecosystem. The city drew over $1.4 billion in investment from Canadian and U.S. companies, with “sources ranging from global tech giants to local startups.” The momentum in investment is reflected in a recent study by CBRE, showing that in the last year, Toronto has created more jobs in the tech sector than its counterparts in San Francisco, Seattle, and Washington, D.C. combined. The author lists the most recent announcements of investment and associated job gains, including industry heavies like Microsoft and Canadian-based Shopify. She also lists the Toronto startups that received part of the total $146.7 million in venture capital or acquisitions in September. The usual means of collaboration between established corporations and startups have been via incubators, hackathons and accelerator programs – many of which, the author (and CEO of Startup Genome) notes, operate on mentor-mentee basis. But today, he continues, “corporations and startups can get to know each other on more equal footing through open innovation programs.” Acknowledging that “the clash of cultures, expectations, and work styles between large incumbent organizations and agile entrepreneurs presents real challenges,” he contends that even so, startups can realize significant benefits if they find the right fit. He then discusses four things startups should look for in a corporate open innovation program: the program breaks open the walls of the corporation; corporations invest resources before the program even starts; corporate scale is put to work; and lastly, there’s freedom to operate. Based on the premise that “a company is only as good as its employees,” the author notes that startups don’t have the budget for turnover — so it is critical not only find the right people from the start, but to retain them. He then discusses eight ways to keep your talent as your startup grows, from making the right hires by looking for “can-do” people and setting clear expectations to being mindful of staff workloads and promoting from within. With the introduction of artificial intelligence (AI) in the workplace, business leaders have access to unprecedented levels of data interpretation to inform their strategy. In turn, this requires business leaders to adapt their approach to developing strategy and to make a shift in their leadership style to better manage their teams that are using AI tech. To ensure your team’s success and your company’s ability to capitalize on AI’s potential, you need to develop three key skills: adaptability, by being prepared to respond to new opportunities or threats to gain a competitive advantage; vision, in establishing a clear focus for your company and instilling it in your culture so teams have guidance even amidst disruption; and lastly, engagement, whereby teams now free of the burden of rote and manual tasks are encouraged to focus on strategic and creative thinking.